Take in hands TIAL-LCP roll and reel out minimum 1 meter. Heat the adhesive layer of the reeled out part of tape with a gas torch until the adhesive layer glitters. Install the heated tape on the pipe with adhesive layer down at a certain angle to provide required overlap. Press the tape edge to heat-insulation surface until tape adhesive layer sticks to the heat-insulation. After the first complete turn the further winding is performed with overlap on previous turns. 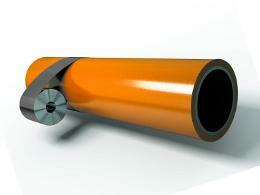 Wrap a pipe section with the tape by spiral winding (2-3 turns) providing minimum 20-30 mm overlap. Perform shrinkage of the tape with gas torches avoiding heat insulation burning. Shrinkage to be carried out for the whole length of the tape. Roll down every turn with silicon roller or manually with heat-resistant gloves. Overlap of turns after application procedure has to be at least 20 mm. Permanently control tape temperature during shrinkage to avoid bubbles or tape burning. In case of bubble forming roll down the coating with silicon roller or manually with heat-resistant gloves. Accomplish the installation procedure with wide moves of gas torches along the whole surface of the covered area. the adhesive layer is evident from under casing ends around entire perimeter of circle. no foam evident from under casing ends. 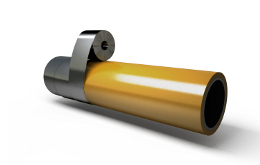 full contact of casing ends with PE jacket.